If you wish to see an enlarged version of any of the pictures below, click inside the small version. 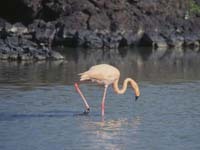 A Greater Flamingo in a lagoon behind Bachas Beach on Santa Cruz Island. 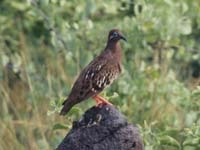 A Galápagos Dove at Punta Suarez on Española Island. 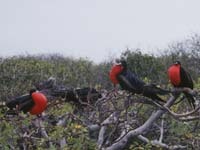 Three male Frigatebirds courting a female at Prince Phillip's Steps on Genovesa Island. 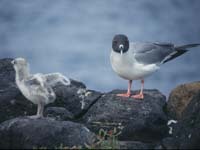 A Swallow-tailed Gull and chick on North Plazas Island. 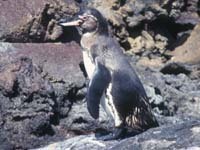 A Galápagos Penguin near the Pinnacle on Bartolome Island. 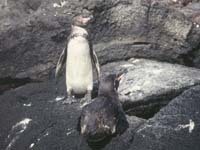 Two Galápagos Penguins near the Pinnacle on Bartolome Island. 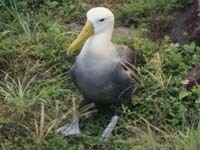 A Waved Albatross at Punta Suarez on Española Island. 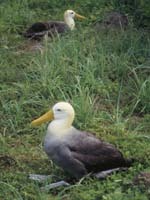 Two Waved Albatrosses at Punta Suarez on Española Island. 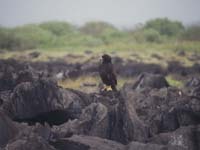 A Galápagos Hawk at Punta Suarez on Española Island.